Where is the Pebble deposit located? The mineral deposit is located in the Bristol Bay region in Southwest Alaska, near Iliamna Lake and Lake Clark. It is in a remote area, near the headwaters to tributaries of both the Nushagak and Kvichak rivers. Pebble West has 569 million tons of ore identified in the “measured and indicated” categories (sampling-based estimates that are considered to be accurate with a reasonable-to-high level of confidence). Another 143 million tons are “inferred” (or estimated at a lower level of confidence). Pebble East has about 1.52 million tons of “inferred” ore. The minerals are worth an estimated $400 billion, mine officials have said. What companies are pursuing development of the Pebble prospect? Pebble Limited Partnership (PLP) is the developer of the proposed mine project. Formed in 2007, PLP is a U.S.-registered company based in Anchorage, Alaska. It was a 50-50 partnership between global mining company Anglo American plc and Northern Dynasty Minerals Limited of Canada. In September 2013, Anglo-American announced its decision to withdraw from the project within 60 days. Mining company Rio Tinto held 19 percent of Northern Dynasty shares and was by extension also invested in the Pebble project. However, in April 2014, Rio Tinto donated its shares to Bristol Bay Native Corporation Education Foundation (which subsequently sold its shares) and the Alaska Community Foundation. Northern Dynasty Minerals is now 100% owner of the Pebble deposit. In December 2017, it appeared that PLP had found a new partner in First Quantum Minerals Ltd. (FQM), based in Canada. The parties announced a framework agreement that included plans for FQM to pay $150 million toward permitting over four years, with a chance to later earn a partnership stake for another $1.35 billion. FQM paid the first $37.5 million installment, which allowed NDM to enter the permitting process. However, finalization of the framework agreement was dependent on several factors, including due diligence and meeting certain regulatory requirements. In May 2018, NDM announced that the budding partnership was off. Neither entity provided a reason. Who owns the land that the Pebble mine claims are on? The State of Alaska owns the lands on which the Pebble project has staked mining claims. This state-owned land is located within the Lake and Peninsula Borough in Southwest Alaska, about 17 miles northwest of the village of Iliamna, and it neighbors the lands of many different owners, including both village and regional Native corporations. In total, the Pebble Limited Partnership holds mineral rights to 415.4 square miles of lands surrounding the Pebble deposit (see map). Other nearby communities include Newhalen and Nondalton. Does any portion of the proposed Pebble mine project involve lands owned by Bristol Bay Native Corporation? No portion of the mining claims is on land owned or managed by BBNC. The proposed mine plan would affect 23 linear miles of BBNC subsurface estate, 7 material sites along sections of the transportation corridor and buried natural gas pipeline. There is no permission granted to utilize BBNC land for this project. View land ownership map. How many jobs might the Pebble development create, and will they go to local residents? PLP estimates that the project would provide more than 2,000 full-time positions over its 20-year life span, with many more during the initial construction period. It had been preparing a workforce development plan, but the status of that plan is unknown. How has the mine plan changed? In December 2017 PLP submitted a mine plan along with its permitting application to the United States Army Corps of Engineers (USACE). In this version of its plan, PLP says that it responded to stakeholder concerns and risks detailed in the EPA’s Bristol Bay Watershed Assessment. It features a smaller mine footprint, increased safety measures, and a 20-year production timeline focused on those minerals that are easier to extract. PLP was originally working on a plan for a much larger mine site to recover much of the mineral resource, an estimated 7.1 billion tons measured and indicated, and another 4.9 billion tons inferred. The 20-year plan anticipates mining just 10% of this: 1.1 or 1.2 billion tons (both numbers are referenced in the Pebble project overview submitted for permitting). This includes 287 million pounds of copper and 13 million pounds of molybdenum per year, for a total of approximately 6 billion pounds of copper/molybdenum. In fact, in May 2018, PLP submitted a technical report describing several changes to the plan. This is the most up-to-date document detailing plans for the proposed mine, although engineering details were still being developed as of late June 2018. The permitting process is iterative, and the plan will likely continue to change during the course of permitting. Plans to expand or develop the mine site beyond the 20-year scope are likely to be considered in the future, and would go through a separate permitting process. Preliminary Assessment – Out of date document that includes an initial vision of what would be required to develop a larger portion of the deposit. It includes information on mining types (open pit and underground); infrastructure needs, such as port site, access roads, warehouses and water systems; and tailings impoundment designs. View map of preliminary mine site layout. The U.S. Environmental Protection Agency published a Bristol Bay watershed assessment in January 2014 that examines a conceptual mine based largely on information in the Northern Dynasty Preliminary Assessment. This document, while considered flawed by developers, did inform the redesign that PLP submitted with the permit application in late 2017. Why is this mine so controversial? The location of the deposit is near the headwaters of the Nushagak and Kvichak rivers, where tens of millions of sockeye salmon return each year, representing approximately half of Bristol Bay’s total sockeye salmon production. According to an economic report developed by the University of Alaska Anchorage, the Bristol Bay fishery is the source of about half the world’s wild sockeye salmon harvest, and is the world’s most valuable salmon fishery. The proposed Pebble mine has entered national debate due to potential perceived risks to salmon fisheries used by commercial, subsistence and sport fishers. Mining opponents believe the mine’s potential economic benefits do not outweigh its risks to the region’s fish, wildlife and the people who depend upon them. Project supporters either believe the risks are acceptable or that any such risks could be adequately mitigated, and are worth taking in exchange for the potential economic benefits. Why are some groups in favor of developing the Pebble mine? Why are some groups opposed to the Pebble mine? Many groups and individuals believe that development of a large-scale mine in the Bristol Bay watershed will cause damage to the environment and harm the fishery. Negative impacts to wildlife and Native cultures have also been raised as a concern. In an independent poll conducted in 2013 by Hays Research Group, nearly 63 percent of voters polled were in favor of a 2014 ballot initiative that would prohibit mining in Bristol Bay. That initiative was passed in November 2014 by 65% of voters and requires legislative approval before a large-scale mine can go forward in the Bristol Bay Fisheries Reserve. Are the people living in Bristol Bay opposed to the mine? A 2011 Dittman survey of Bristol Bay Native Corporation shareholders commissioned by BBNC found that 81 percent are opposed to the mine. In a separate poll of Alaska voters, conducted in 201 by Strategies 360 and commissioned by BBNC, 53 percent of respondents statewide had unfavorable views of the project. How might the proposed Pebble mine affect salmon runs and habitat? Just what impact a mine project such as Pebble would have on Bristol Bay salmon fisheries has been the subject of considerable debate. Concerns have been raised over possible impacts from such changes as new road construction crossing salmon streams, or mine operation activities — such as use of local water and tailings disposal — that could harm fish or fish habitat. In response to those concerns, Pebble has shortened the transportation corridor in favor of a plan to ferry slurry across Lake Iliamna to a new port at Amakedori. It also added a lining to the tailings pond, and says it won’t use cyanide to extract gold. The Pebble Limited Partnership (PLP) has said the existing permitting process – informed by data from its Environmental Baseline Document (EBD) – will adequately predict potential impacts and protect salmon and habitat. EPA’s final Bristol Bay Watershed Assessment concluded that even under day-to-day operations, a large-scale mine would cause inevitable impacts, including the loss of fish-supporting streams. An Environmental Impact Statement developed by the U.S. Army Corps of Engineers as part of the permitting process will identify areas of concern. PLP Environmental Baseline Document – Chapter 15, “Fish and Aquatic Invertebrates,” provides baseline data with descriptions of fish and habitat in the North Fork Koktuli River, South Fork Koktuli River and Upper Talarik Creek watersheds, but does not predict potential impacts. Read the study. Keystone Center science panel – “Fisheries and Marine Ecosystems.” In October 2012 the nonprofit Keystone Center conducted a science panel that included a focus on fish in Bristol Bay. The panel consisted of independent scientists who commented on the work presented in PLP’s EBD, and questioned whether fish populations are characterized well enough in this area. Watch video of this session. U.S. Environmental Protection Agency’s Bristol Bay Watershed Assessment – EPA published the final version of this document in January 2014. It focuses on how large-scale mine development could affect the waters and fish in the area. The assessment concludes that mine development would impact fish negatively, through the loss of streams and wetland habitat and potential affect on water quality. Executive Summary (published January 2014). How will the public be able to comment on concerns about salmon? The public can address potential impacts on salmon runs and habitat during comment periods associated with the U.S. Army Corps of Engineers’ preparation of an Environmental Impact Statement for the project. Additional permits related to protecting salmon include the Fish Habitat Permit and Fish Passage Permit, neither of which allow for public comment. However, thousands of people commented on impacts to salmon during EPA’s public review of its Bristol Bay Watershed Assessment. Additionally, a 2017 citizen’s initiative and a separate but similar House bill seek to add protections to salmon habitat. What is the Environmental Baseline Document (EBD)? In January 2012, the Pebble Limited Partnership released its EBD, presenting data collected in and around the Pebble deposit area and transportation corridor. This EBD contains thousands of pages of information and data about the physical, biological and human environment in Bristol Bay and Cook Inlet study regions. PLP has called the EBD the “cornerstone” of the permitting process. This is likely because it includes many of the same topics and data that will appear in an Environmental Impact Statement (EIS), the document used by government permitters to review proposals before mine permits are granted. However, an EIS would also include other components, such as an analysis of how the mine plan would impact the environment, and a range of alternative actions that would cause fewer impacts. Baseline data such as that included in the EBD is also typically used to support engineering designs included with a mine plan. Read the Pebble Watch Explores EBD guide for an overview. Find the original EBD here. What is the Keystone Center? Keystone is a nonprofit organization based in Keystone, Colo. It was engaged by the Pebble Limited Partnership to conduct an independent stakeholder assessment and science panels on the proposed Pebble mine. As part of the panels, third-party scientists reviewed and commented on environmental baseline studies conducted by PLP. Despite its funding, Keystone has maintained that it is independent. Proceedings of panels organized by Keystone in October 2012 and May 2013 are available to view online. How do we know that the science is adequate to create a mine plan? The main scientific documents available so far that are associated with the Pebble project — PLP’s EBD and EPA’s Bristol Bay watershed assessment — have both been challenged publicly, and their accuracy has been a matter of public debate. Environmental impacts can only be understood by accurately assessing current conditions and predicting how those conditions might change due to development. The EBD is a collection of multiple scientific studies (conducted by 40 different companies and research firms) that describe the environmental conditions in the project area over the period from 2004-2008 (some studies have continued in order to provide additional data). Portions of the document have been reviewed by independent scientists through the Keystone Center’s dialogue process, which resulted in specific recommendations for further study. PLP stated that it took into account some of those recommendations. The EPA watershed assessment went beyond characterization of the environment to include discussion of the potential risks of large-scale mining. A 12-member review panel studied two drafts of the assessment and provided specific recommendations to EPA. The agency took those into consideration in preparing the final document, and has published its response to the comments. Developers need dozens of separate permits (local, state and federal) to begin construction and operation of a large-scale mine in Bristol Bay. The state of Alaska Large Mine Permitting Team coordinates state permits. The U.S. Army Corps of Engineers is the lead agency for the permitting process, and will write an Environmental Impact Statement (EIS) to assess risk of the development. The state of Alaska also requires Reclamation Bonding in order to ensure there are enough funds to reclaim a mine site if developers are unable to do so (if a project fails financially, for example). An EIS is required under the National Environmental Policy Act (NEPA) for any project that might significantly affect the environment. An EIS is a decision-making tool. It lays out both positive and negative environmental effects of a proposed action. 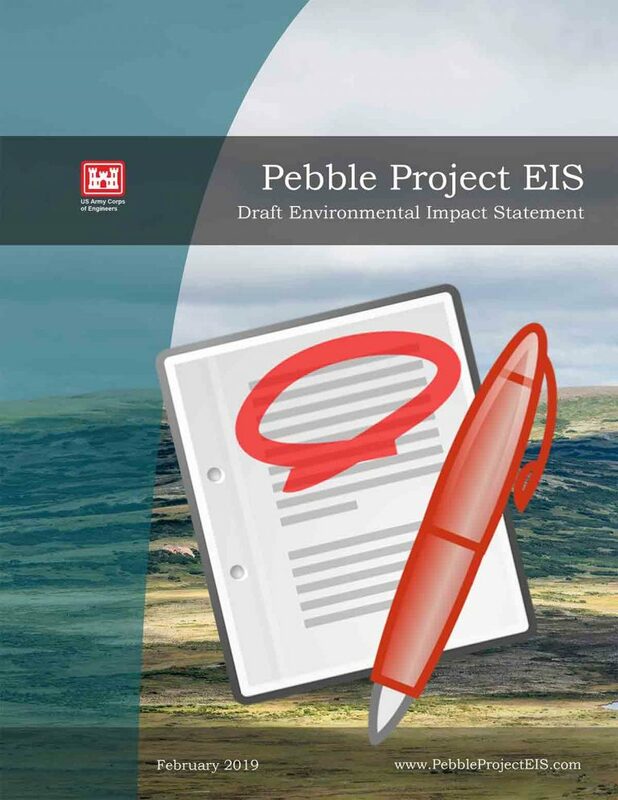 Every EIS includes alternative actions, including the impact of a “no action alternative.” The U.S. Army Corps of Engineers is currently in the process of developing an EIS for the Pebble project. Its website includes information about public input periods and documents related to that effort. How long does permitting take? It was expected that the permitting process would take three to four years or more. However, the U.S. Army Corps of Engineers published an aggressive 24-month timeframe for its part of the permitting, so the process could be shorter. 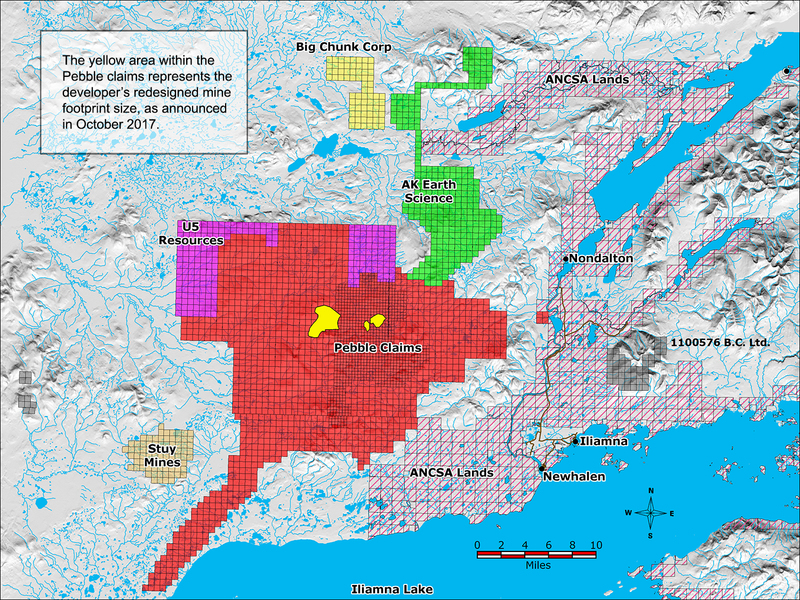 Another large Alaskan mine, Donlin Gold, began permitting in mid-2012 and is still awaiting a Record of Decision (as of March 2018). How can I keep current on the status of the permitting process for the proposed Pebble mine project? Pebble Watch will post this information as it becomes available. You can also sign up for our newsletter. I have an opinion on the mine and would like to share my concern/support. How do I make my voice heard? Permitting – There are dozens of permits necessary for development of the proposed Pebble mine, and some of them offer public comment periods. Pebble Watch will track and post information on public comment periods as they are scheduled. Developers – To express concern or support to Pebble Limited Partnership, you may use this form located on its website. Pebble Watch – Various resources at this site can help answer your questions, including a permitting timeline and permitting guide with links to various state and federal agencies. You may also send your specific questions to the Pebble Watch team at staff@pebblewatch.com. Bristol Bay Native Corporation – Contact the BBNC Land Department by calling (800) 426-3602, or use this contact form. What is the U.S. Environmental Protection Agency (EPA) Bristol Bay watershed assessment? In February 2011, the EPA announced plans to conduct an assessment of the Nushagak and Kvichak watersheds in Bristol Bay, to determine the impact of large-scale development in the area. The final document was published in January 2014, after two drafts, a peer review, multiple public meetings and thousands of public comments. Why did EPA conduct a watershed assessment? In 2010, several tribes and organizations asked EPA to step in and use its Section 404(c) authority under the Clean Water Act to limit development in Bristol Bay. Before acting on such a request, EPA chose to conduct the watershed assessment. In January 2014, EPA finalized the assessment. In February 2014, EPA announced that Pebble mine would likely result in “significant and irreversible negative impacts” on the Bristol Bay watershed and its salmon fisheries. This conclusion was based on data collected in the process of conducting the watershed assessment and information in the initial mine plan submitted by Northern Dynasty Minerals to the Securities and Exchange Commission. How can EPA affect development of the Pebble mine? The Clean Water Act is federal legislation that helps protect U.S. waters. Under the act, a Section 404 permit is required when a developer plans to discharge dredged or fill material into the waters of the United States, including special aquatic sites such as wetlands. The U.S. Army Corps of Engineers issues these permits. However, the EPA also has authority under the act to veto such a permit before the permit application is submitted, while it is pending or after it has been issued, if the agency determines the discharge will have “unacceptable adverse effect on municipal water supplies, shellfish beds and fishery areas (including spawning and breeding areas), wildlife, or recreational areas.” EPA initiated this 404(c) process in February 2014 and developed a Proposed Determination detailing restrictions on mining activities it suggests for the Pebble deposit area. In 2014, PLP brought three lawsuits against the EPA, claiming violations of federal law, and indicated it was considering filing up to five other claims. In May 2017, EPA and PLP agreed to settle the litigation to “avoid the delay, uncertainty, inconvenience, and expense of protracted litigation.” As part of the settlement, EPA has agreed to withdraw the Proposed Determination and will not pursue the next step in the process, a “Recommended Determination,” until 48 months after the settlement (or until the U.S. Army Corps of Engineers issues a final environmental impact statement, whichever comes first). (See our graphic guide to the 404(c) process.) PLP would have to apply for a permit within 30 months of the settlement (which it subsequently did) in order to take advantage of this forbearance. About the 404(c) process. About the Proposed Determination. The 2017 EPA/PLP settlement. BBNC’s Board of Directors adopted a position against the mine. Why is it producing Pebble Watch as an impartial information source? Many other sources exist that provide opinions or advocacy for and against the mine. According to BBNC, its position against development of the Pebble mine was based on science and was made after careful consideration. Pebble Watch was created to help shareholders and others educate themselves, to assist with research and questions, and to promote openness in information about the proposed mine and any related public processes. It was also created to provide a forum for civil discussion and exploration of this challenging topic. Is BBNC against all development in Bristol Bay? No. BBNC’s land management policy draws upon Responsible Resource Development standards for social, environmental and fiscal sustainability. Pebble Watch is a project of the Bristol Bay Native Corporation’s Land Department. Who is the ‘Pebble Watch team’? The Pebble Watch team includes scientists and science outreach communicators with expertise in finding and understanding scientific data, as well as experts in land management and permitting – most of whom are employees of BBNC and its subsidiaries. If we do not know an answer, we will research it and provide the best available answer. We hope you will consider our team to be a resource shareholders can use when you are having difficulty finding the data or answers you need. Does Pebble Watch oppose the proposed Pebble mine? As an impartial, educational and fact-based initiative, Pebble Watch neither supports nor opposes development of Pebble mine. The purpose of Pebble Watch is to help BBNC shareholders and other interested parties stay up-to-date on the Pebble project’s development and permitting process, including how to access and understand available resources and scientific data. Pebble Watch does not seek to reflect current BBNC Board or corporation views. For those purposes, the corporation will continue to use methods such as press releases and its website to communicate to shareholders and the public. What is the goal of Pebble Watch? Scientists are not always in agreement when it comes to the proposed Pebble mine. Sifting through data, reports and peer review recommendations requires a basic knowledge of scientific terms and concepts that most non-scientists do not have. Through publications, posts and educational materials, Pebble Watch seeks to provide summaries and overviews of these materials, so that readers can get the basics, know where to search for additional resources, and begin to formulate their own questions for study authors. In this way, they can join the scientific conversation that will ultimately affect the future of large-scale mining in Bristol Bay.